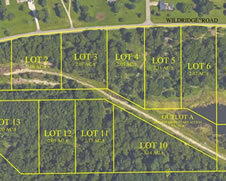 A subdivision of land or land so divided which creates one or more parcels containing less than 160 acres, exclusive of public roadways, in order that the title to the parcel may be sold or otherwise transferred and includes any re-subdivision and a condominium. The term also means an area regardless of size, that provides or will provide multiple spaces for rent or lease on which recreational vehicles or mobile homes will be placed. To require transferring interests in real property by reference to a plat or certificate of survey. A major subdivision creates six or more lots. A minor subdivision creates five or fewer lots. Easy right? It is a little more complex than that. To determine the number of lots being created, we look at the total number of lots divided from the original tract of record since July 1, 1973.